We started work on the B4058 High Street, Winterbourne on Monday 23 July 2018. Work has progressed well although it is a complicated site on a busy route and we have encountered more problems than expected. This work is due to be completed on Wednesday 24 April 2019. We are undertaking the majority of the work using temporary traffic signals, however, there may be the need to close the road for limited periods. Access for residents and businesses in the High Street will be maintained during any closure period and a signed diversion route will be in place. Before the scheme can be finished, we need to carry out upgrades to pipes near the one-way circulatory system leading to Flaxpits Lane and Dragon Road. This work will begin in the next few weeks. We will continue to work under temporary traffic lights but the traffic management will affect the one-way system in this busy area. There are likely to be delays and we apologise for this additional inconvenience. 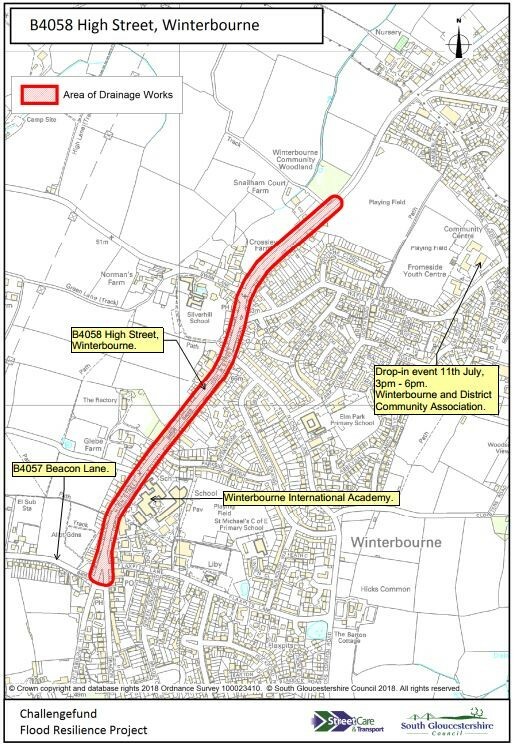 High Street, Winterbourne was selected as one of nine sites across South Gloucestershire as part of a wider £3.35million Government funded scheme to improve drainage and flood protection systems. Members of the project team were on hand to answer any questions about the work we are carrying out, the benefits it will bring and the traffic management required.